23 March 2016, at 12:00a.m. SOUTH AFRICA - Two outbreaks of low pathogenic avian influenza hit South African poultry farms last week. Previous outbreaks have mainly hit commercial ostrich farms, and the newly reported outbreaks were no exception. Out of the five low-pathogenic H5N2 outbreaks reported, four were on commercial ostrich farms and one was on a duck farm. 175 birds died in the outbreaks out of a susceptible population of over 12,000. 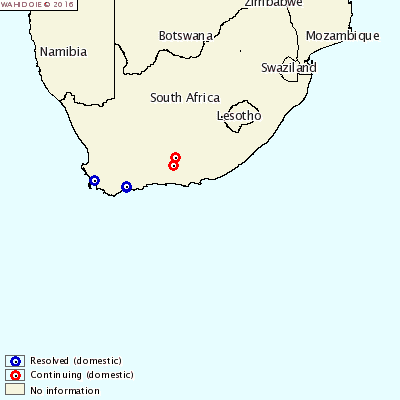 The outbreaks occurred in the Western Cape and Eastern Cape provinces. The source of the outbreaks is unkown, but movement controls, screening and quarantine measures have been used to control the disease.